Pakistan army is land services branch of Pakistan Armed forces. It start functioning 14th august 1947 after the separation of British Indian army. The main headquarter is located GHQ Rawalpindi. Pakistan army performs their duties in the United Nations to maintain the peaceful environment. Pakistan Army always performs the inter services the navy, Marines and air force. They performed their tasks in excellent way. The Pakistan army is currently working under the supervision of general raheel Sharif. The armed forced is worked under the commands of the federal government. Everymen is wish to join Pakistan army because every person is wish to love the motherland of the Pakistan. To avail the opportunity, there are large numbers of job vacancies are published in the well reputed newspapers. There are different departments in the Pakistan army. All the Pakistan army job vacancies are published in the large cities of Pakistan. Pakistan army always looking for young, talented. Pakistan army is going to offering the in different departments. Those candidates who come up the eligibility criteria, can apply for the Pakistan army jobs. Pakistan army is maintain a great discipline all over the Pakistan. Pakistan army also help out the others countries to maintain the peace. Whenever Pakistan army announced the job vacancies, all Job vacancies are announced in well reputed newspapers. All experienced and non-experienced can apply for the job vacancies. Ilmkidunya is working for the welfare of the society. All job seekers can review the jobs page and apply for the Pakistan job army vacancies. 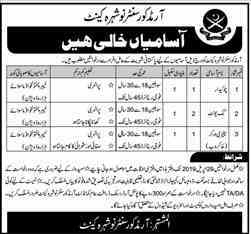 All job seekers must stay connected with this page come to know latest Pakistan army vacancy announced in newspaper jobs. We expected that all the job seekers find this web page very helpful in search of pak army jobs.